← January 11, 2014 The transition continues. BMW Tigard. Friday night was my first presentation back home. Was amazing to have a full house ….. So much to share and talk about that I did not really get whole trip out, but still was a fun evening! Will learn, adapt, improve and share in new ways in the future! Thanks to all the ADV riders who attended, drove long distances Like IdahoSam, Bug Sister, Steep and Rocky, and an old college roommate Tom, that I had not seen in 17 years or so! Was really great to be among friends, and fellow Moto riders as I shared more than a few stories! 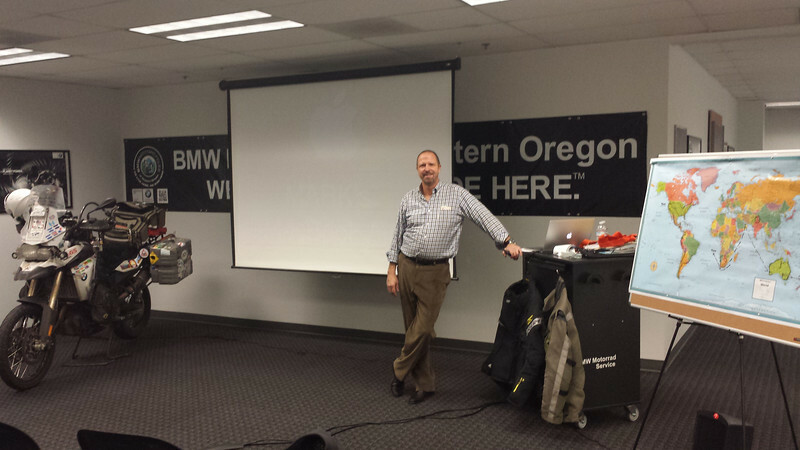 Busy week getting revised materials and then riding up to Seattle for presentation on Thursday Night at Ride West BMW !